you are referencing - your praises and protestations fail to even rise to the level of being wrong, they are but verbal dust to be brushed away, meaningless and of no consequence. But if you are one of that thoughtless many, you may take comfort in the knowledge that you are in the happy company of millions of such Pavlovian 'Conservatives', Pro-Regressive Leftists and Libertarians, for whom the United States Constitution is little more than a paper bell which they bark at. Whether you are 'for or against it', especially on this day, in our day, you'd be wise to consider what would happen if we should lose the last vestiges of it, and those protections it uniquely extends to both sides. For those of you who already do, or who are at least willing to make the effort to, understand those ideas which animated the framing of this document, those of you who understand that such principles and ideas as these cannot be owned by any race or culture, but can only be discovered by some for the benefit of all, then by virtue of that understanding, you and I are unified through these thoughts which were so well formed, written down, and 'completed' (and not to forget the first debate on amending its completion), on 'the Seventeenth Day of September in the Year of our Lord one thousand seven hundred and Eighty seven'. 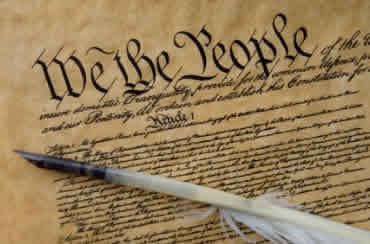 One final point, whether you are an old hand with, or relatively new to, this document and its ideas, I take it as an obvious point that your reading of it can be greatly improved and informed by those arguments for, and against it, that were in the minds of those who debated the writing and ratifying of it. One of the best tools I've ever found for considering and reflecting upon the whole or particular parts of the Constitution, is the University of Chicago's site "The Founders Constitution". Scroll down on the contents page and you'll find that it goes through the Constitution clause by clause, and that each is supplied with a list of links to those relevant portions of not only the Federalist and Anti-Federalist Papers, but to documents which the Founders had in mind when writing the Constitution, to what the Anti-Federalists objected to (this is particularly helpful in understanding the arguments for the Constitution which the Federalist Papers make), as well as early Supreme Court opinions and judgments that were relevant to that clause being acted upon, as well as the commentaries by early Supreme Court Justice Joseph Story (which are fantastic).